to generate discussion about ways in which the learning can be applied to your agency. At the time of death or suffering serious harm, most of the children (84%) were living at home, with at least one parent. 41% of SCRs related to children less than 12 months old and 22% to children aged from one to five years; 28% were of children aged between 11 and 17. Non-fatal physical harm often occurred in the home amid domestic violence and chronic, neglectful care of the child. Professionals will often come into contact with a child, young person or their family when the child is vulnerable to harm. These interactions present crucial opportunities for protection. Responding to these opportunities requires the ability to recognise (or see the signs of) vulnerabilities and potential or actual risks of harm, maintaining an open stance of professional curiosity (or enquiring deeper), and understanding one’s own responsibility and knowing how to take action. Many referrals of children being abused and neglected come to the police from practitioners in other agencies or from members of the public and these are normally routed to specialist child protection officers. However, opportunities to notice and respond will also often arise in the course of other duties, such as a police officer executing a drugs warrant, a probation officer visiting an offender on licence, or a youth offending team (YOT) worker supporting a young person. The SCRs often reflected highly complex situations in which multiple risks and vulnerabilities interacted, often over considerable periods of time. This complexity was exacerbated by the interactions between multiple professionals working with the family often in isolation from one another. These factors appear to interact creating cumulative levels of risk the more factors are present (p77). Some factors such as domestic abuse are always harmful to children, but others, such as parental mental health problems, do not necessarily indicate risk of harm (p84) and must be considered on a case-by-case basis. Other relevant family factors include poor engagement with services, housing issues (including overcrowding), parental learning disabilities (that impair parenting capacity), a pattern of repeat 999 calls, and parental beliefs and practices (including home education). 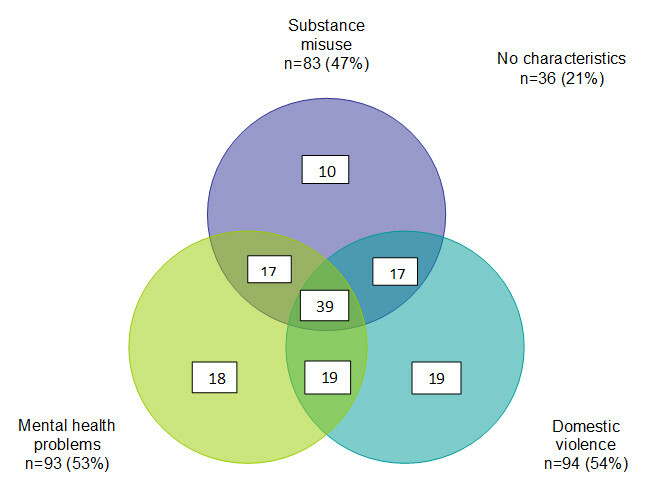 The Venn diagram shows the overlap of three of these factors (domestic abuse, substance misuse, and with mental health problems) within the 175 families. It is worth noting that there were 36 families (21% of the 175) where none of the three problems were recorded as being present. The central section represents the 39 families (22%) where all three factors were recorded as present. Two of the three factors were noted for 53 families (30%). Finally there were 47 families (27%) where only one of the factors was noted. There has been considerable progress over recent years in recognising the harm caused to children through all domestic abuse and this was evidenced in good practice observed in many of these SCRs. However, an incident-focused approach to domestic abuse was noted as a limitation in several SCRs. Police officers would respond, assess and act on any risks to the children as a consequence of a specific incidence. This approach fails to recognise the ongoing nature of domestic abuse and the daily reality with which women and children are often living and does not provide a longer-term view about the role of the perpetrator in the family. This approach carries the risk of harm to children continuing unabated for long periods of time. When a woman retracts or refuses to pursue an allegation of abuse the police may have little to proceed with in bringing charges, but may still have serious concerns. The recent introduction of an offence of controlling or coercive behaviour in intimate or familial relationships (Serious Crime Act, 2015) needs to become embedded in the thinking and action of professionals in response to domestic abuse. Violence to a child or children, following an acrimonious separation of the parents was apparent in 25 of the 175 SCR final reports and may reflect the continuation of coercive control and domestic abuse following separation. In many cases there were ongoing issues around contact and residence. Often this came to light through private family law proceedings, and in some cases it was a court case, or pending court case, that appeared to have been a trigger for parental filicide. It was clear from a number of reports that the effect of separation on the child could be hugely damaging, even when not noted in the final report as being particularly acrimonious. The impact of parental separation may be even more marked where a mother has multiple partners over time, offering little stability in the child’s life. Family law courts should consider the impact on the child of any contested proceedings, contact arrangements, or parental allegations and counter-allegations. Children’s rights and needs should always come before those of either parent. Acrimonious separation and contested proceedings may be warning indicators of possible future serious or fatal harm to the children. Neglect was a factor in two thirds of the non-fatal SCRs and over half of the fatal cases, irrespective of the primary category of abuse identified by the SCR. There were six children who died directly as a result of extreme neglect; these children ranged in age from four months to seven years three months. In all of these six cases, there were multiple concerns about the welfare of the children over a period of time and there was evidence that the family was isolated, or that this was a particularly vulnerable mother. Neglect was given as the primary incident cause in 14 non-fatal serious case reviews. The median age of these 14 children was six years, with a range in age from new-born to 17 years of age. Although there is emphasis on the effects of neglect on the youngest children and their developing brains, the age group where neglect is most prominent in SCRs is among young people aged 11-15, where the impact of neglect over many years becomes apparent. The cumulative effect of abuse and/or neglect in childhood can lead to mental health problems and other difficulties in adolescence. signs of abuse or neglect may be masked by or misinterpreted as due to the underlying impairments. Government guidance, What to do if you’re worried a child is being abused (HM Government 2015), sets out signs and symptoms of different types of child abuse and all should ensure they are familiar with it. Entrenched criminal activity by one or both parents was a feature in a number of SCRs. A typical pattern of crime included drug offences, burglary, criminal damage, assault including domestic abuse, wounding with intent and, on occasions, firearm possession. Wider family members could also pose a risk of harm to the child through their criminal activity. A custodial sentence may be a temporary protective factor. For other children it might remove that parent’s care and financial contribution to the family, as well as any meaningful presence in the child’s day-to-day life. The report highlights adolescence as a specific stage of development [that] presents particular risks of death and serious harm (p99). The report includes an in-depth examination of the SCRs involving suicide or child sexual exploitation (CSE). The behaviour of many of these adolescents, for example going missing from home, involvement in criminal activity and anti-social behaviour, could bring them into contact with the police. Self-harm and risk-taking behaviour were common themes, as were substance misuse, risky sexual behaviour, gang membership and suicide attempts. Cocktails of drugs and alcohol, combined with psychological frailty, led to behaviour that was at times extremely dangerous. The reports include many examples of police and other professionals focusing on young people’s behaviours and not their underlying vulnerabilities: [This] inability of all services to see the child as a vulnerable child rather than a troubled or troublesome young adult was a common and recurring theme (p110). A key feature of the CSE reports was practitioners seeing CSE not as sexual abuse and exploitation but rather as a ‘lifestyle choice’. This was reflected in the view amongst some professionals and within organisations of the victims as difficult girls making bad choices (p132). This is reflected in the lack of interest or professional curiosity in the issues identified in South Yorkshire Police’s senior command in the Drew report (2016). Many of the SCRs, particularly those involving 11 to 18-year-olds, recounted episodes of young people going missing, sometimes ongoing over long periods. It was often during these episodes that young people were most vulnerable with increased use of drugs and alcohol, anti-social behaviour, offending and sleeping rough or staying with un-known adults. Children repeatedly going missing should trigger police officers’ professional curiosity. Rather than seeing such behaviour as ‘street-wise’ or ‘wilful’, it’s vital to consider what is motivating the behaviour. It is important to share information gathered from contact with the young person and the safe and well check that suggests increased risk and vulnerability (p117). The nature of child maltreatment is such that concerns are often difficult or impossible to substantiate. There may be a lack of supportive symptoms, there may be alternative and plausible explanations, or those involved may withdraw disclosures or allegations. All disclosures of abuse and neglect by children need to be taken seriously. A situation where a previous disclosure is not repeated in a video interview does not mean that the abuse and neglect did not happen. Even where concerns cannot be substantiated, potential risks to the child must be considered, addressed and monitored. Local teams need clear procedures that respond to the needs of children and families when the threshold for child protection is not met or concerns are not substantiated or when court hearings have concluded that a child has not suffered significant harm but professionals have ongoing concerns. This may be achieved, for instance, through a child in need process and clarity about any ongoing risks. Given that criminal justice agencies often deal with specific incidents, supervise individual offenders or investigate stand-alone crimes there is a risk of seeing a family only through one lens. Cases in the report remind us that protecting children and young people involves understanding their lives and experiences and making professional judgements in the round. Many children will not readily disclose abuse or neglect, so professionals have to be able to spot the signs and create a suitably safe and trusting listening environment. This is particularly important when children display early signs of neglect or emotional abuse, but are unable to express their concerns (p133). 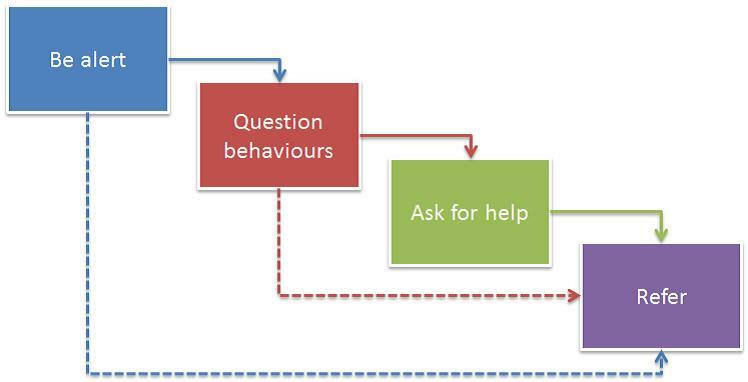 Figure 2 shows some simple steps to take when signs are recognised, questions asked and concerns persist. If any child is in immediate danger, it is not necessary to go through each stage: professionals should refer straight away. Working together is the key to keeping children safe. Whether through specialist units such as child protection teams, partnership arrangements such as Multi-Agency Safeguarding Hubs (MASHs) or the management of offenders through probation or YOTs, this must involve collective assessment and planning supported by accurate and timely information sharing. This can be through formal child protection procedures or other partnership arrangements, such as MAPPA (Multi-Agency Public Protection Arrangements) and MARACs (Multi-Agency Risk Assessment Conferences). Inter-professional dynamics, systems and processes can unintentionally impede good joint working. For example, the report found evidence of subtle hierarchies, such as practitioners deferring safeguarding responsibilities to social workers, according undue weight to medical opinion and not challenging senior professionals (p208). 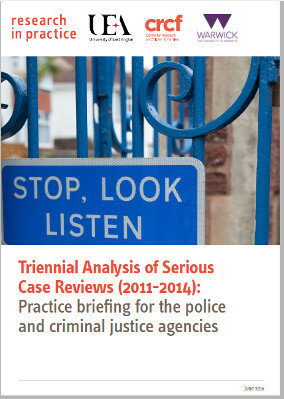 The report stresses the importance of good multi-agency assessment, planning and action. Whilst some agencies will see and assess risk differently, a common narrative is needed so that all commit to safeguarding the child together. It is crucial that MAPPA, MARAC and child protection teams work to achieve this. Despite their significance in statutory guidance, the relative absence of any consideration of the purpose, nature, or effectiveness of strategy discussions in many of the SCRs suggests they are a neglected component of safeguarding practice (p172). Professionals do not always appreciate their important role in collating and appraising information, determining risks to the child and formulating a plan. Where they do occur, they are sometimes delayed, professionals can be absent or appropriate reports or information is missing. Strategy discussions are a central part of the safeguarding process and should be accorded due weight. They provide an opportunity for information and opinions to be clarified. As consistent invitees, police are well placed to ensure these are robust and effective. The child had no cot and was sleeping with [the mother]. Anti-social behaviour was continuing and [the mother] was at risk of eviction. There were complaints of parties and drug taking whilst [the child] was present. All national guidance and legislation supports sharing information to safeguard children but the SCR analyses over that last ten years suggest that deep cultural barriers inhibit effective information sharing (p167). The Data Protection Act 1998 and human rights law are not barriers to justified information sharing, but provide a framework to ensure that personal information is shared appropriately. An alternative to the default position not to share information would be to presume that any information that has a bearing on child welfare should be shared with other professionals unless there is reason not to, placing the onus on the practitioner to make an active decision not to share information and to document their reasoning (p168). Establishing clear procedures or using pro-formas can help ensure that requests specify what information is being sought and why. This can avoid unnecessary delays in the receiver being forced to seek clarification. Permitting direct information sharing in safeguarding cases instead of relying on slower routine methods (perhaps through third parties) can ensure the information gets to the right people quickly, allowing them to act. Best practice should be to combine direct verbal or face-to-face communication with clear and comprehensive follow-up documentation. Where front-line workers express concerns or share information with child protection agencies but receive no feedback, their confidence in the process may be undermined. Child protection agencies must feedback promptly to referrers and others participating in safeguarding. Where services are identified as fragmented, or operating from different settings or management structures, setting up clear pathways and agreements to allow effective information sharing is crucial. Information must be triangulated and verified. This involves seeking independent confirmation of parents’ accounts and triangulating information between professionals. One approach to improving inter-agency communication was through practitioner forums, offering support to isolated professionals and creating an arena where disagreements could be raised without families present (p169-170). An example of good practice in information sharing is highlighted in which the police sent notifications of domestic violence not only to the normal partner agencies, but also to local schools. Teachers are in an excellent position to help children and young people discuss their situation and this background knowledge may also help explain a child’s absence, poor attainment or bad behaviour (p169). The wealth of information within legal and forensic records places courts in a position to be a vital resource to other agencies. However, guaranteed access to such information by other professionals is not commonplace. Policy level negotiation for this could greatly enhance the effectiveness of the child protection system. The police and criminal justice sector changed significantly over the period covered by the report. Probation has split into the National Probation Service and Community Rehabilitation Companies, and Police and Crime Commissioners and the National Crime Agency have been introduced. Navigating complex agency structures can be difficult, both for professionals and families, and misunderstandings can occur and information-transfer be disrupted. Decreasing budgets are also creating strain, as agencies and partnerships seek ways to re-organise and stretched resources impact upon capacity. In one case, for example, the police maintained that with 15 children going missing every day and several officers re-deployed to a major sporting event, they lacked the resources to carry out a key enquiry (p193). Such pressures can lead to short-term pragmatic solutions rather than consideration of the ongoing needs of families (p194), but protecting against vulnerability and risk is incompatible with episodic approaches as safeguarding requires coordinated and holistic planning and long-term intervention. establishing policies, processes and practices that see the child as the primary focus throughout, avoiding short-term or expedient alternatives. As well as structural and cross-agency issues, the report suggests other areas that may impede child-centred practice. These apply to all agencies but the following are particularly pertinent to those within the criminal justice system. Target-driven practice While useful in some ways, professionals can be influenced by the targets themselves rather than the specifics of the case. Rigid processes Frameworks to guide and support professionals are important, but they need to reflect the realities of the environment in which services operate in order to ensure opportunities for intervention are not missed. High thresholds or professional desensitisation Caution is needed in areas with a high child protection workload and volume of needy children. It can be difficult to differentiate those families for whom there are particular risks from all the others. Frequency of demand Systems should recognise that repeat domestic abuse calls or episodes of going missing can indicate vulnerability for children. Embedding an understanding of the nature and importance of signs and symptoms of abuse especially around neglect, domestic violence and CSE. This should emphasise behavioural presentation in particular. Supporting all staff to exercise professional curiosity in responding to signs and symptoms of abuse and risk. Developing systems and awareness that highlight the increased risk of trigger events, multiple vulnerabilities and coercive and controlling behaviour. Establishing clear internal and external referral pathways enabling professionals to readily obtain support, engage other agencies and share information. Enabling systems to flag risks identified by partners (eg, child in need or child protection plan status) so they are readily available to child protection and other professionals. Establishing and agreeing with partners a common understanding and language around risk. Establishing innovative approaches to risk management when children or adults disengage from services. Ensuring Missing Persons policies require that children are considered as at risk of abuse or neglect and action is taken to safeguard them. Drew J (2016) An Independent Review of South Yorkshire Police’s Handling of Child Sexual Exploitation 1997-2016. Police and Crime Commissioner for South Yorkshire. HM Government (2015) What to Do if You’re Worried a Child is being Abused: Advice for practitioners. London: Department for Education. National Multi Agency Child Neglect Strategic Work Group (2015) Child Neglect. Be Professionally Curious! London: Action for Children.